My wife’s 5S is two years old (25 months) in pristine condition. She was very satisfied with her iPhone until iOS 11. Battery life suddenly drops from 5 hrs or more to 3 hrs without any change in her habits. iOS 11.1 didn’t help much. According with a battery info app, battery still is in good shape (91% of original charge) so that’s not a factor. 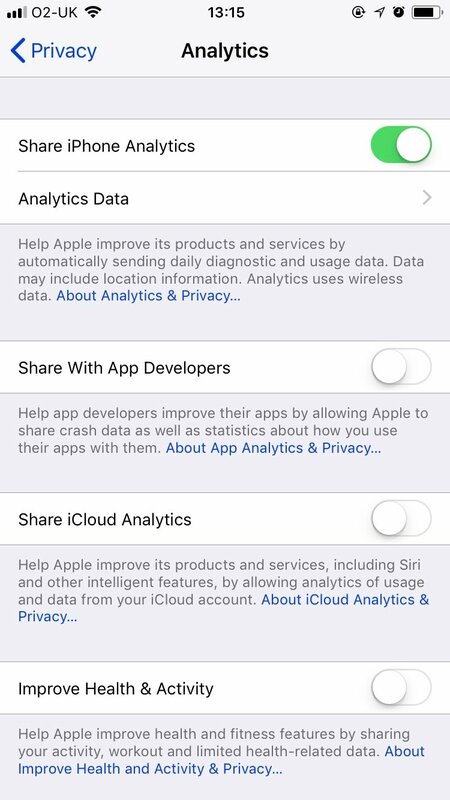 Is any analytical data being sent to Apple? This used to consume a fair bit of data and battery in the past. I think it’s turned off but I’ll check. By the way, I didn’t notice any anomalous data consumption. It used to consume battery and data in the "past", now it’s optimized. Maybe, wait for a month or two and 11.2 will be out, by then, try a restore. I checked: it is off. Hopefully 11.2 works better for you. I've been running it since yesterday and so far things appear stable. No major battery drain. Knock on wood. I've honestly been pretty lucky with iOS 11. Only 11 was really buggy. .1 and now .2 have been decent.